"This is a lovely variation of chicken chili. 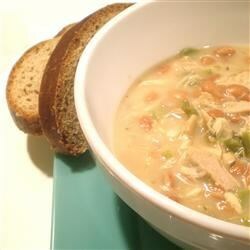 More a bean soup with chicken and chili seasonings." This chili is excellent. I used my food processor to grind the chicken breast. I made this for my father who does not like chicken and will not eat it. He loved it and asked for more!